The self-priming, low pressure filling pump fills the sprayer rapidly even with the tractor engine at idle, thus reducing fuel use and noise during the filling process. In addition, Direct Rate Control of the spraying pump is able to adjust between minimum and maximum output in less than three seconds, increasing rate control accuracy to a level that conventional systems cannot match. This is especially important during headland entry and exit, where changing forward speeds and automatic section switching place heavy demands on rate control systems. In addition, Direct Rate Control significantly improves the accuracy achieved in variable rate applications, where large changes in target rate may be required. 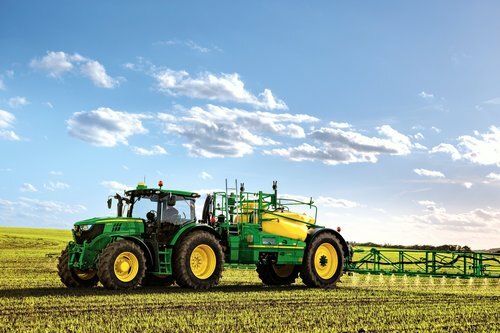 Combined with ‘smart’ hydraulic control of the solution system, Direct Rate Control allows spraying to be completed independent of the tractor engine rpm. AutoPowr IVT or DirectDrive tractors with engine/transmission management can be operated in 'ECO' mode, with the low engine rpm significantly reducing fuel consumption during spray applications. PowrSpray comes as standard with Auto Filling, Auto Agitation Intensity control (where the tank agitation intensity decreases as the solution tank level lowers), Power Agitation (for maximum intensity agitation of difficult to mix products) and the unique Auto Dilute rinsing system. R900i Series PowrSpray machines can also be optionally equipped with John Deere's automatic Section Control and BoomTrac auto boom levelling systems.